LED lights’s supply and demand is likely to reach balance sooner than predicted as price falls ease in price falls in 2013 due to exit of many Chinese LED lights manufacturers, said David Chung, Genesis Photonics Inc. (GPI) chairman during the Sustainable Green Development Global Green Business Outlook 2014 conference held by the Ministry of Economic Affairs on December 17th, 2013. 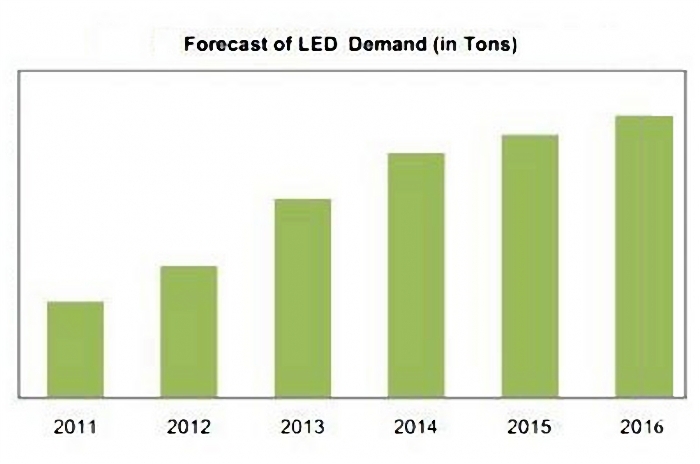 The LED lights industry could see a rebound after the 2014 Lunar New Year. Chinese large production capacity in led lights lead to an oversupply problem in 2011, said Chung. The market originally estimated a turnaround by 2015, but with gradual growth of LED lights demand in 2013, the turnaround might happen after Chinese Lunar New Year. Chung is optimistic about supply and demand balancing out by early 2014. Over the last few years, the Chinese LED lights industry has been in depression, having been ruined by oversupply issues triggered by government subsidies in 2011 that led to manufacturers soaring production capacity. Chung pointed out product prices are beginning to decline as many Taiwanese-origin LED lights manufacturers back out of the market. High powered chip prices for example are already reduced 5 percent in 2013. The markets long awaited automotive LED lights sector has finally seen signs of growth this year. Automotive LED lights are driving up growth for overall demand in 2013, said Chung. The LED lights industry could show clear signs of recovery after Chinese Lunar New Year displaying an S curve development trend. Chung believes that automotive LED lights output value in 2013-2018 will have a compound annual growth rate (CAGR) of 30-40 percent.